The first full-length biography of one of the most unlikely figures in twentieth-century American literature. Geltner’s biography, the first of any kind on Crews, manages to unearth the writer from the accumulated crust of legend and rumor ... Geltner dutifully covers Crews’s early life, but his retelling is, unsurprisingly, no match for A Childhood: The Biography of a Place, Crews’s searing memoir about his first seven years that represents the peak of his storytelling prowess ... The 'crazy party' stories in Blood, Bones, and Marrow—the time Crews showed up drunk at his lecture dressed as a gorilla, the one where he broke up with a woman by peeing inside her car, that day he passed out in a pool of vomit in the faculty lounge—begin to blur together after awhile. Through the fog of alcoholism and self-destruction, what comes into focus is his remarkable output ... Throughout the book, an obvious warmth for his subject shines through, though Geltner doesn’t let it interfere with the thoroughness of his reporting. If there is a fault in Blood, Bones, and Marrow, it might be that it is a bit too thorough—reading it, you sometimes wish Geltner had excised passages about outside players in the Crews story to get back to the main event. It’s a small complaint for a work that does real justice to a complicated, outsized literary figure. [Geltner has] written a lean and pleasingly consumable book by sticking to essentials. He’s delivered what Vladimir Nabokov said a biographer should: 'plain facts, no symbol-searching, no jumping at attractive but preposterous conclusions, no Marxist bunkum, no Freudian rot' ... This biography comes to weird, florid life in its middle sections. As Crews’s star rose in American fiction, he reveled in his outsider status ... Harry Crews led a big, strange, sad and somehow very American life. It is well told here. ...a deeply researched, fascinating and even-handed biography of an enormously complex figure ... Geltner doesn't flinch from the dark side of Crews' character. He details how often the author's drinking and drugs derailed his classes and public appearances, how many friends spent enormous amounts of time and patience looking after him, how often Crews got into physical fights (and, Geltner notes, usually came out on the losing end; a lifetime list of his injuries occupies nearly a third of a page) ... On the page and in the flesh, Crews was a controversial figure, and Geltner gives us the rough edges. Crews was as improbable as many of his characters, and so was his success. 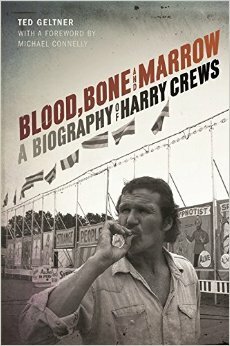 What did you think of Blood, Bone, and Marrow: A Biography of Harry Crews?